Watch out essential oils – there’s a new kid in town. Okay, CO2 extracts aren’t entirely new, but they are gaining in popularity and are more readily available. I should explain that a CO2 extract is a plant product obtained through an extraction process that uses pressurized carbon dioxide. This differs vastly from an essential oil made via distillation, but both processes produce concentrated liquids (or semi-solids) that are highly aromatic making them useful in Aromatherapy. Throughout Aromatherapy’s past, aromatic substances have been used that are produced from other methods besides distillation, namely Absolutes. An absolute, extracted from a solvent such as hexane, is typically preferred by Perfumers over Aromatherapists due to the concern of the remaining solvent in the product. This solvent may possibly cause health or sensitivity issues so it is usually shunned by Aromatherapy professionals. But CO2 extracts do not have this issue. CO2 extracts use carbon dioxide (CO2) as the solvent. “In its normal state, carbon dioxide is a gas that we breathe continually. Carbon dioxide can be pressurized until it becomes a liquid. The liquid carbon dioxide then acts as a solvent that can dissolve the natural components present in botanical material that is exposed to the liquified CO2. Afterwards, the CO2 is brought back to natural pressurization, and the CO2 returns to its normal gaseous state. What remains is the resulting CO2 Extract.” And, just the CO2 extract. The process of making CO2s requires expensive equipment and a certain knowledge, so they have not been a popular item to produce for Aromatherapy. However, with the expansion of hemp extracts, this process is making a resurgence. The cannabis industry is their own group, but their proliferation is making CO2 extracts more common in the United States. Aromatherapists can now find a wider selection of CO2s. The body of knowledge of how to use CO2s is limited but expanding as more and more Aromatherapists add them to their aromatic arsenal. They have similar uses to essential oils but they include chemical components previously unavailable in essential oils. Therefore, Aromatherapy practitioners need to take into account the special chemistry of a CO2. 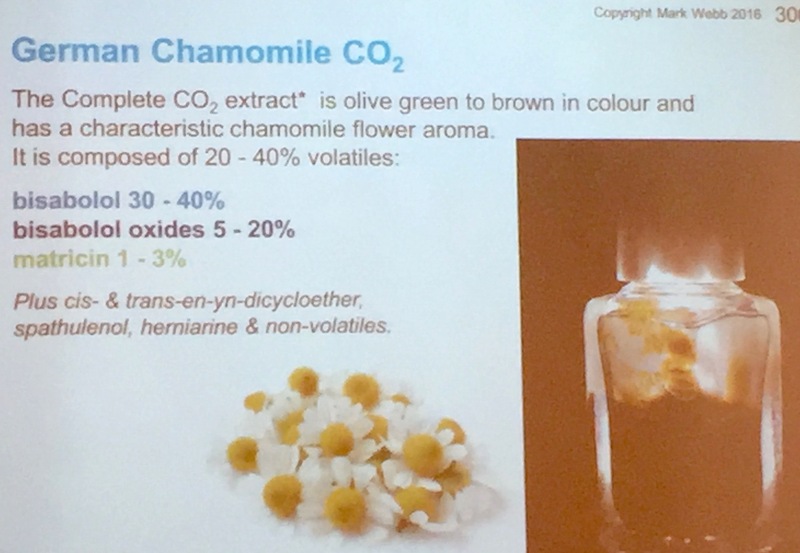 This could mean that a CO2 has more use in Aromatherapy applications, as with the CO2 of German Chamomile (Matricaria recutita) and its greater content of anti-inflammatory substances. However, this CO2 is a thick, waxy substance that is much more difficult to work with than the essential oil. So, as Aromatherapists start to include CO2s in their formulations we can all learn more about the applications of these intriguing substances.